Getting Heads in Beds During Slow Summer Months. 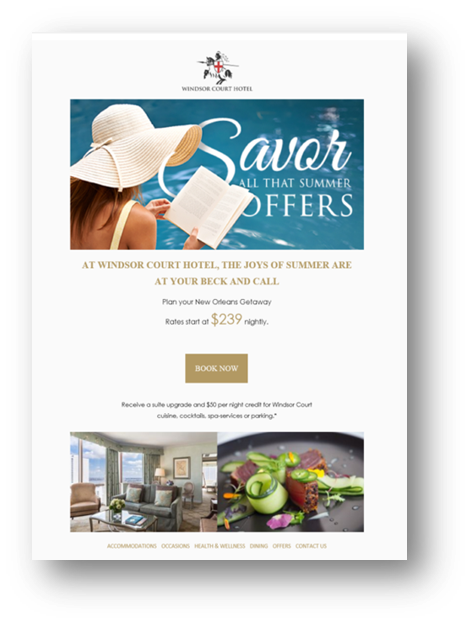 To combat the slow shoulder season New Orleans always experiences in the sizzling summer months, DEVENEY was charged with implementing a summer campaign to increase room bookings at Windsor Court Hotel during this time of year. The strategy was three-fold: to maximize brand reinforcement to ultimately motivate the actual purchases. We used a multi-channel approach with integrated lists to make sure we were reaching our audience through targeted efforts, and reinforcing our message when needed. We also used this list technology to engage with those that were most likely to book.